I recently hosted a Boston Handmade meetup, and gave a lesson in feltmaking. That made me think about the resources out there for learning how to make felt. Sadly, Felt: New Directions for an Ancient Craft (Interweave Press, 1996) by Gunilla Paetau Sjöberg and Patricia Spark is no longer in print, because it’s one of the few books that provides both a comprehensive history of felt, including modern trends for felt as an artistic medium, as well as detailed instructions on many techniques. 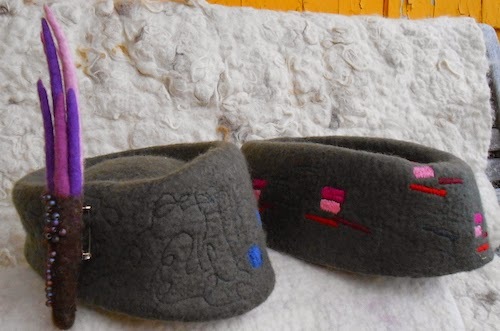 There’s also information about sheep breeds and comparisons of their wool when made into felt. Uniquely Felt (Storey Press, 1996) by Christine White is pretty much the Bible of feltmaking. It’s still in print, and is a great first choice for a strong grounding in the fundamentals of making felt. The equipment section describes why some felters prefer one tool or anther, helpful input for your own choices. The projects include detailed explanations of the factors in play in the feltmaking techniques, as well as suggestions for rescuing projects that are going awry, which teaches you a lot about what exactly is going on when you make felt. Feltmaking and Wool Magic (Quarry Books, 2006), by Jorie Johnson is another excellent technical book, but is currently available only as an e-book. Originally from Boston, Jorie Johnson has lived and taught feltmaking in Japan for the last 30 years but also offers workshops worldwide. Her chapter on making felt samples from different types of fleece provides helpful guidelines for making felt swatches from the wool you are using in order to measure the result and achieve consistency for future work. The projects in Fabulous Felted Scarves (Lark Books, 2010), by Chad Alice Hagen and Jorie Johnson, show you how to incorporate a variety of three-dimensional textures into scarves and shawls, and take advantage of felt’s properties, such as its resistance to raveling when cut. A number of projects borrow dyeing and shaping techniques from shibori, Japanese resist-dyeing, to add layers of pattern and design. Fabulous Felt Hats (Lark Books, 2005), also by Chad Alice Hagen, is, sadly, out of print. It is a great introduction to basic millinery with handmade felt. The projects showcase how to use the malleable quality of felt – how readily it can be shaped as it is being made -- to create simple berets, understated hats with brims, or more theatrical headpieces with greater dimensionality and protuberances. How We Felt (Interweave Press, 2007) provides an inspiring gallery of projects and artists and show the possibilities for feltmaking, including rugs, bags, hats, and boots, beads, upholstered furniture, and sculptures. Having prior feltmaking experience is recommended if you want to try these projects; the instructions are rather condensed. Sheila Smith’s Felt to Stitch (Batsford, 2014) and Lizzie Houghton’s Felting Fashion (Batsford, 2009) are also easier to grasp if you have some felting experience. Both authors are British artists. Both books provide many close-up photos of the surfaces of the finished pieces, in order to highlight the textures you can create when you add fabric to felt, stitch on it, dye it, stretch or cut felt. Felt to Stitch offers general guidelines for making a nuno felted jacket that are really useful to an experienced felter. Modern feltmakers, at least in the USA, use pool noodles, bubble wrap, and thin pieces of plastic in their feltmaking process. But if you want to know what the previous generation of feltmakers used before plastic became ubiquitous, check out How to Make Felt (Search Press Ltd, 1995) by Anne Belgrave, another British feltmaker. Check out the animal masks on her website. What how-to books have made it onto your own bookshelf?